So I probably shouldn’t be writing about comfort food such as a Maid-Rite. But tomorrow is going to be sixty degrees outside, and anyway, a Loose Meat Sandwich. With yellow mustard. And pickles. And lots of ketchup. Maybe we should take a look? If you're someone who likes to make changes to recipes, by all means. But promise you'll make the original recipe at least once? You may not have the new-to-you house, but at least you got the spring cleaning out of the way – motivation at its finest. Maybe I need to go look at a new house to get a little motivation. Oh, and the sandwich looks divine. It’s funny how when you do one project, it leads to many. I’m repainting my dining room and when I took down my blinds, they looked too dingy and not white, so now new blinds too. Sandwich sounds easy and can be taken in so many directions. That sounds like an awesome sandwich, although I am quite certain that more of it would end up on my lap than in my mouth LOL. I can’t wait to make these for my fam! Making a maid rite or a loose meat sandwich whichever you call this sandwich is always a winner. Everyone can put what topping they want on their bun. It is kinda messy so bring out the napkins. That looks like a great sandwich for the snow days we have been having here. 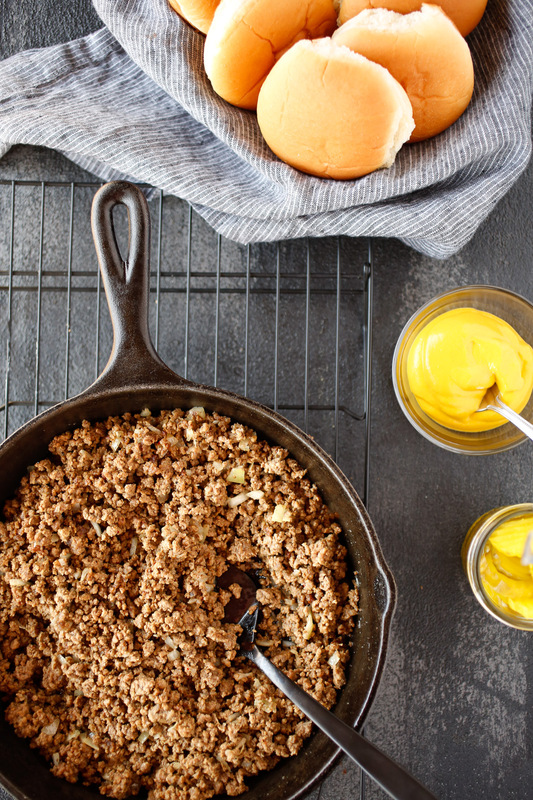 It’s like a sloppy Joe without the sauce and it looks so yummy. We love meat sandwiches around here! This one looks really great- always a winner in our house. And we just moved..so in the process of unpacking now..I swear there is always decluttering that needs to be done. Some of the things we brought with us I’m like, really? WHY do we even need this? LOL! Cleaning my house is definitely something high on my list right now. My problem is I would continue to lose my foot over and over again because I’m a klutz LOL. I like the idea of just sitting back and drinking wine I would take out the middleman and skip the whole decluttering and going straight to the wine LOL. I love looking at houses on the market. I tend to stick to browsing photos online, and then feeling horrible about my own house. I look around and see clutter, etc. Then I declutter, paint, etc. It’s a vicious cycle. Anyway….this sandwich sounds simple, and perfect for those busy night! I have a recipe for a sandwich very similar to this one. I have been making it for my family for years, and it is always a hit. The kids love it as well as the adults. We enjoy it year round too. 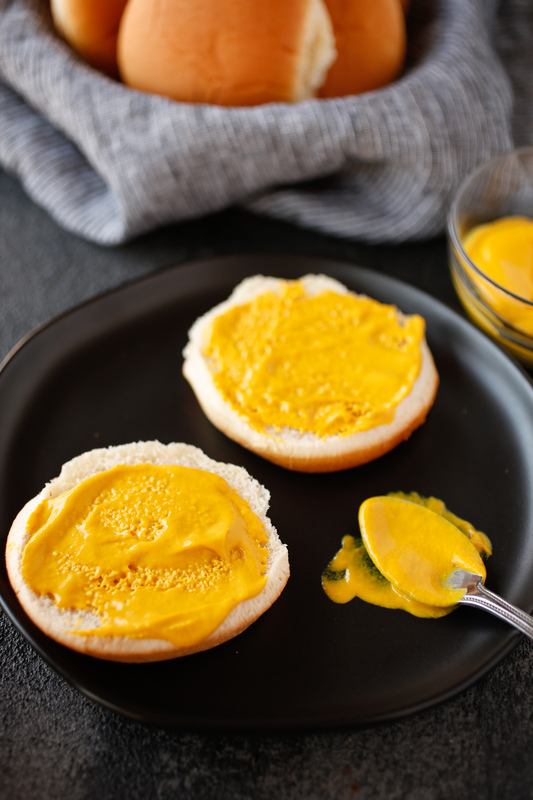 I’m not crazy about the yellow mustard but for my husband, it is a must. When I think of it, it brings back some fun family memories of laughing around the table. My mom used to make something like this but mixed ketchup, mustard, and BBQ sauce into the meat. I also experienced a similar cleaning and organizing frenzy last August when I randomly decided I wanted to move into a new apartment. My hubby and I had to do everything super fast because we were leaving for our honeymoon and moving just days after getting back! I reallg need to get our flat cleaned and decluttered i keep putting it off though! Oh that’s one delicious sounding sandwich! Spring cleaning time might be my favorite time! We have lived in our house for over 10 years so we have a ton to go through. I have BIG goals this year! ha! I have never had a Maid-Rite sandwich before. I’ve heard them called loose meat but I never knew it was just browned hamburger. 10 day cleaning? That must have been amazing. I want to deep clean the house too. I need to declutter, I feel I keep “collecting” things. I love the recipe and it looks so easy to make. I think I will try it for our next movie night. I always love reading your stories. Great storyteller. A lovely recipe to try, without a doubt. Especially if you’re feeling like giving yourself a treat for all the stress that came through during the week. This is definitely something that I’ll make! I’m sorry about the house, maybe it isn’t the one, maybe another one will come by and you’ll love it even more. Oh baby these looks really great! My kids would eat this up with me. I am so ready to get the cleaning going on. These sandwiches are great for the breaks! So I too feel scattered the same as we plan to change our house which has better natural light than our current ones. Basically, we need more space, but this house hunting has taken lots n lots of energy out of me. This simple sandwich looks great to eat with a small glass of mojito for me. Yummy!Sandwiches are my breakfast favorites as well. 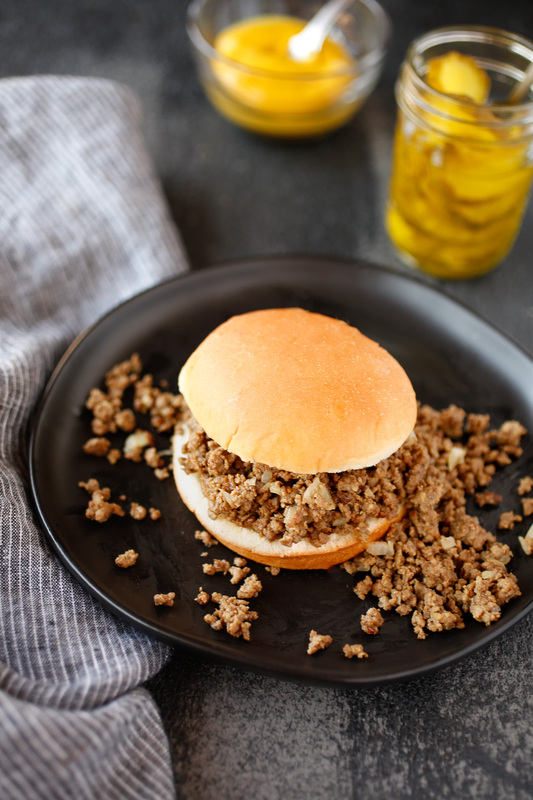 With ground beef , this sandwich by another name surely looks delicious! I’m sure you’ll find an even better house that you’ll love and adore. There will always be days when nothing seems to go right and some comfort food will definitely make things feel better. I think this one’s a must try. It looks so good and it’s not at all difficult to make! I had never heard of a Maid-Rite until I moved to Iowa and it seems the locals love them! It is kinda like some of my favorites from childhood in Jersey I guess. Sometimes growing up with something can make you crave it for life, it just tastes like home. I have never tried one still but maybe I need to, I guess it is more than just a sloppy joe, I need to try the mustard, that sounds interesting. Cleaning, rearranging stuff at home makes me think clearer and fueled my sense to do other needed task too. Thanks for the tips about the sandwich, a very nice alternative, healthier than usual patty. I love cooking, food. blogs and lovely writing, so I’m not so sure why it took me so long to discover your site. But now that I have, I feel like I’ve found something I was missing. Thank you for sharing your stories with such honesty and heart and humor (the three cardinal “H”s!). I can’t wait to read about your next adventures in food, friendship, family and cooking… you know, all the things that make life wonderful. What a week for you! (By the way, I’ve done the furniture polish on the floor thing– don’t wear socks.) 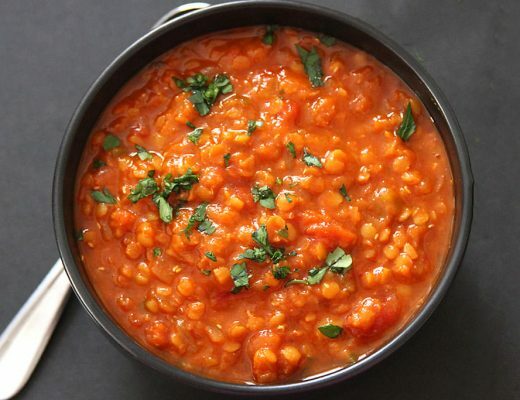 Recipe sounds mouth-watering and reminds me of visiting my grandma in the Midwest every summer when I was growing up. This post is wonderful! Your description of the week is too cute – but then to end with a loose meat sandwich – who would have thought? I’m really excited to try them myself! I haven’t started spring cleaning yet, but I do plan on doing it next week, once I am sure that every member of my family will pitch in their efforts and not make it a one-woman job like they did to me last year. Oh, BTW, I love that sandwich! That would be perfect to have for an early dinner if it would only be me and my husband at home. God Love You! Isn’t moving (and Spring cleaning) a trial?? We seem to declutter quite often in our house and end up asking ourselves, how is it that we keep amassing all these things which we know we won’t miss when they’re finally sorted? That sandwich looks amazing by the way! This looks delicious. What a great way to serve a favorite sandwich! Getting your home ready to sell is such a huge task! Last year we went from considering listing our house, to making an offer on something else and getting ours listed and sold in a week. Worst week ever! But what a daunting task to get tackled – I bet your house looks amazing now! That’s the stuff memories are made of… 🙂 Glad you found a simple, lovely recipe to counter the after-effects of a 10-day cleaning binge! Oh my, the Swiffering of the ceiling is great! I’ve figured out regular broom works pretty well. This sandwich give me hope. After the snow in Chicago today… I really need spring. I know exactly how you feel. I always try and scrub my walls with Brillo pads and end up getting little blue specks everywhere. The sad thing is it takes the blue specks to remind me that there will be blue specks…ridiculous. On a different note, Yay for spring, and yay for yummy (and messy) sandwiches! Oh yum was craving a meaty sandwich yesterday and I’m so glad the weekend is here for my grocery shopping. This looks like a very good meal to try for the weekend. Sorry you didn’t get the house that you were looking at. But at least you got to do some work on the one you are in now, even if it did come with a stubbed toe and other various ailments as a result of the process. And it’s great your husband participated in all of this while not complaining. You have found a good man indeed. As for the sandwich it does really look delicious. I wonder if I could do something with the mustard for me. I would like it, but my daughter wouldn’t be as thrilled. Although there is nothing wrong with making it for myself. 😉 . Hope you are having an amazing weekend. Too funny! Several years ago my children “discovered” the joy of Pledging the floor. I had to be very careful after that! I can totally relate to the furniture polish incident. I’ve thought about writing them a letter asking if they’d put a warning on the can or something. I nearly killed myself a few times. The funny thing is that I forget so I almost fall and then not even five minutes later I almost fall again. Thanks for your writing – it makes my heart happy. Sorry to hear you didn’t get that new home. But on the bright side, you’ve tackled some chores around your own home that will help you feel as though your home is new again to you. That sandwich looks wonderful! Sorry you did not get the house! This sandwich looks incredible – I would never think to serve the meat loose, I am definitely going to try this. It looks rather simple to make … perfect for when short on time … I might have to switch the meat with a veg. crumble or something but a great idea. And as always I love the pictures. Never had a loose meat sandwich before – it’s a bit like a deconstructed burger, isn’t it? Looks like it would really hit the spot after some cleaning. Ooh this looks so good! It’s so cold here right now so I am all about the comfort food. I’ve never had a sandwich like this before but I suppose it’s only like a burger that isn’t moulded together, I bet the texture is lovely! You reminded me that I need to start Spring Cleaning. And declutter. Big time. I’m sorry you didn’t get the house! This sandwich looks incredible! What a perfect dinner. Happy Spring cleaning! The only time of year where cleaning cobwebs off the ceiling seems fun (and totally necessary). If you need any pointers in that area, my husband prefers to use this odd, flat, cotton mop thing we have. I have to say this sandwich looks absolutely delicious! And your photos are amazing! That sandwhich looks incredible! by the way these photos look great. Going to try this recipe as I need new ideas for lunches! 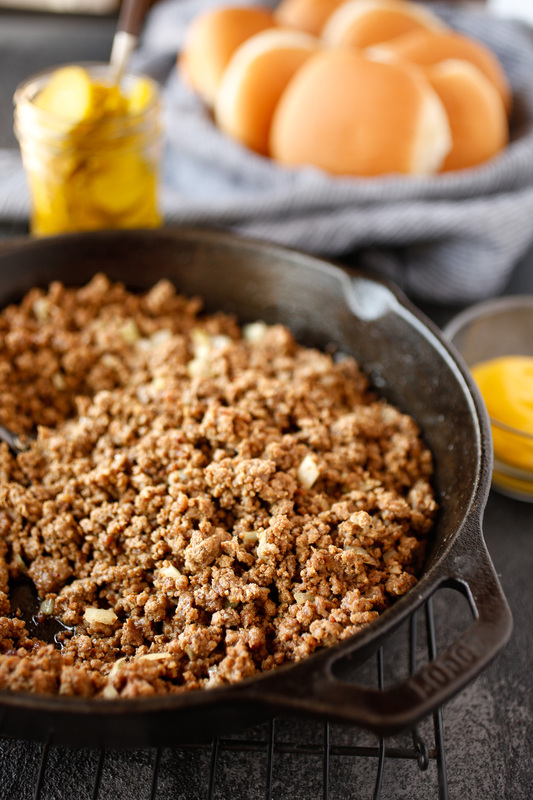 I have to admit I am not a fan of sloppy joe, but this looks so good and I LOVE mustard so I am down since you said with an unheard amount of mustard. Makes me happy. BTW wild hair, funny. I actually love the wild hair look and since oil training my hair it has more texture. Your spring cleaning list, with all its mishaps, made me smile. And then it made me very, very glad that I’m not moving, nor plan to move, for a very, very, very long time. 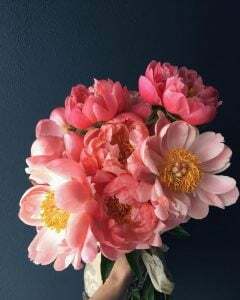 Happy (almost) Spring! Ooft – that first part sounds all too familiar with the de-cluttering and the cleaning. My particular highlight was moving a full bag of rubbish to a new flat and I try not to think about how many hours we spent cleaning flats that weren’t clean when we moved in but had to be spotless for moving out… But that sandwich! I’ve been looking at this and wondering how it would taste and while I’m not keen on well-cooked burger meat, I am still curious. I’m sorry you didn’t get the house, but I’m a firm believer that everything happens for a reason. That sandwich looks great, I could do with one right about now! I always enjoy how your blog posts have little stories in them. It sounds like a good declutter and spruce up was just what you needed to fall back in love with your home. The meal looks great. I am a veggie but your photographs are really stunning! Hands up I love a good sandwich and these sound absolutely delicious. I am really trying to make new ideas dor myself and the other half as well of late. I love a good sandwich, regardless of it’s name 🙂 I do think that reorganizing your home can really cause you to work up an appetite. Something like this is quick and easy to make, and hard to resist. Your post is so amazing, I really liked the way you had the little story inside the recipe post. The sandwich sounds so good and I am already preparing myself to do the decluttering before spring. Ali, I simply adore your writing and your posts. You have this extraordinary gift of making me (and I’m sure all your readers) feel as if we know you, as if we’re friends and tomorrow we will walk into your kitchen to share some food and conversation. And I adore your recipes as well. My favorite being the delicious Drip Beef with thyme and onions. Love love love. Thank you for doing what you do and making me smile and especially for inspiring me to meld my two loves: writing and food. Spring! Such a welcome respite from the cold. We don’t have four seasons where I am but I did experience spring in the US one time and it’s just lovely. I was just ready with my antihistamines. In our house, spring or not, I really need to de-clutter. It may not be a 10-day thing, but maybe, I would need at least 2 days to get stuff sorted out. Thinking about it makes my head spin. Hope I can get to doing in in the next couple of weeks because the clutter is also making me crazy! Anyway, now I am craving for burger! I liked “Stare into the middle distance.” Superb. 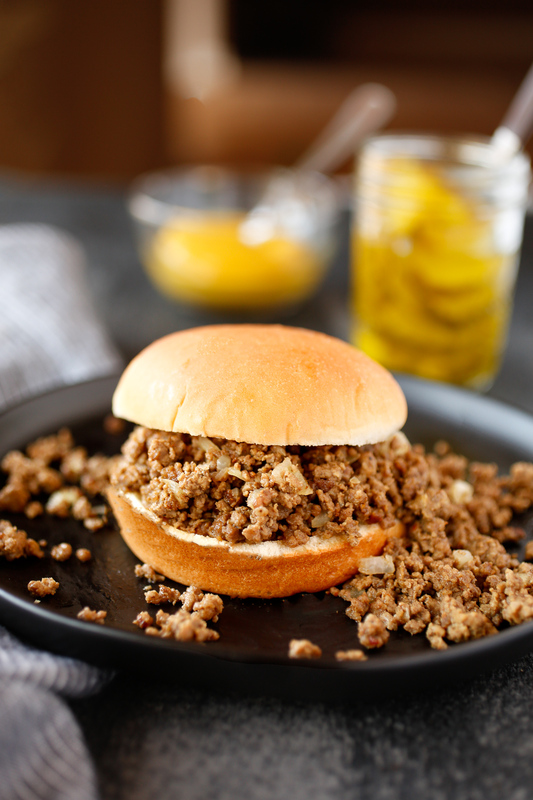 This sandwich reminds me so much of a sloppy joe (my favorite) but without the sauce. Looks very yummy! This sandwich looks soooooooooooooooooooooooooooooooooooo delicious!! I’m actually going to make it tonight for my husband when he comes back from a baseball trip. I’m forever always spring cleaning when I’m baking or making some sort of dinner. Great post! I don’t even want to THINK about what we have to get done for our house to be ready to go on the market. Good luck with all that work! You might not got the house, but at least you got up to date with the works needed at yours. And in the near future, as you have already taken the first steps, why not making exactly as the one you wished to buy was? The sandwich looks delicious by the way, definitely great for a break between painting walls. I made these this evening and they were a big hit. And then, thinking about that, I realized it was your recipe for Western Casserole I made two days ago to rave reviews. So thank you for two great recipes in one week! I love how you weave food and life. I love that your writing makes me want to cook more. Maybe it’s not even the item that you’re writing about, but it sends me to the kitchen. Your blog is definitely my favorite. Thank you for your recipes and inspiration. I love you his simply and quick recipe. I don’t have a lot of time to prepare meals nowadays, so with a little ketchup and mustard being added to the sandwich, it’s great to go. I love how easy this looks! I bet my kids would tear it up! I’ve never heard of this before but it sounds so yummy! I will have to check it out. I love how you include a glimpse into your life and a recipe. The recipe was easy and delicious. Will definitely be making it again. This look simple enough to make but still delicious. I have never made a mince burger before so will give this a try the next time we get some burger buns. Sorry you didn’t get the house. We are in the middle of buying a house right now, and it’s so stressful… This sounds like the perfect comfort food though, haven’t ever tried them before! That sandwich is simple but looks absolutely DELICIOUS. I would not mind one, two, or eight of these at this very moment! I am glad that you managed to get some spring cleaning done although sorry to hear about your bruise, I do hope it heals soon. While you might not have got the house at least you have each other and a loose ‘sandwich filling’ sounds pretty delicious to me.I have some vegan meat that I need to use up so a sandwich it is for me tonight as I am too tired to create anything else aha! Spring cleaning. We’re in the midst of it ourselves. We’re contemplating moving and I keep saying, where did all this stuff come from? Not fun at all. Unlike this loose meat sandwich. We call them sloppy joe’s, who knows why? But they are a delicious comfort food. I have to start Spring cleaning! Wait, Spring starts tomorrow so ok I’ll start tomorrow. Fingers cross. I also plan to paint as we are considering selling the house. Where do I even start. I think I’ll watch a movie first and play a scrabble or two like you. I need that sandwich every 2 hours once I really start on my chores. 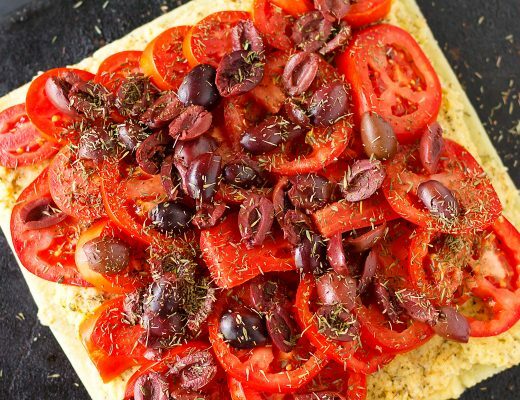 I’ve never tried anything like this, it looks delicious, I’d like to try it with some veggie mince, do you think that would work? Alison, you should always be writing about comfort food now matter the season lady. besides it’s cold as balls here in London and this sandwich would certainly warm up our cockles. What an adventure! I am sorry for laughing but you did a great job with the itinerary. And yes it has happened to me too, cotton thingies on the ceiling…. I love the name of this sandwich! In South Africa we have something called Vetkoek with minced meat. The vetkoek is basically fried bread dough filled with a delicious minced meat filling that has similar ingredients to your loose meat. Except maybe a little bit more saucy. Oh I’m sorry you guys didn’t get the home, but Im sure they’ll be another even more fabulous one in the works. This sandwich gives me a sloppy joe feel without the sloopy lol. We’ve been having some colder weather in california so this hearty sandwich is right up my alley right now. Wow, this looks amazing. My husband and I are going to try this for sure. He mentioned he wants to make it for his crew at the fire station too! Thank you for sharing!! We are also in the midst of cleaning and decluttering, all while completely remodeling our garage and converting it into a game room. 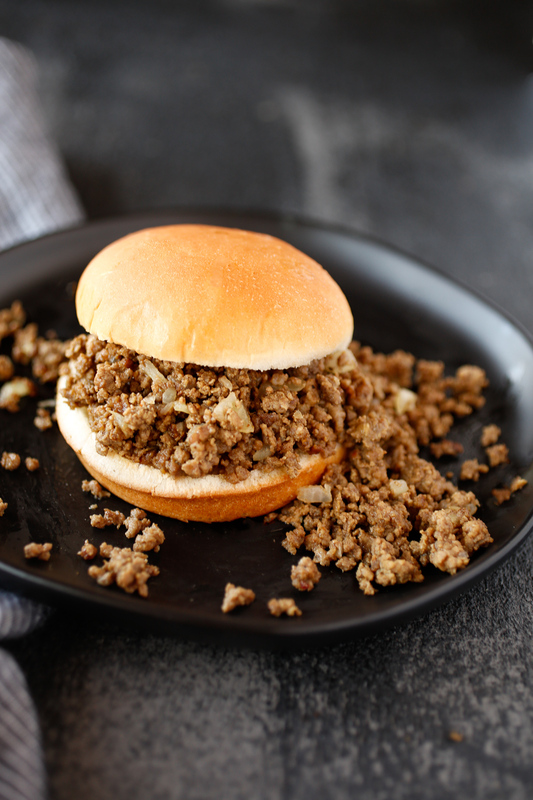 I love loose meat sandwiches and a simple ground beef and onion saute is my favorite (I’m not a fan of the mustard.) However, I don’t eat bread… But I’ve found a single romaine lettuce leaf “Boat” works perfectly! Yes to spring cleaning and decluttering! I love a clean and fresh house for the new season. Hope the bruise is all healed now. And as always, the recipe and imagery are stunning. My partner will totally love the idea, I am not into meat lately. I think I am broken :)) or is just the spring asthenia. They have a name and a fesstival for this sort of sandwich here. I think they add flour to it I didn’t see that in your recipe. I make this often its a hit in my house. Scrabble, Willie Nelson and that sandwich – how could one want more? I bet the cleaning was chaotic (love your description of the process, though! ), but it must be so satisfying to look around and see everything in order. You’re definitely ready for springtime. Sorry you didn’t get the house, at least you have your house all sparkly and new though. I completely understand the furniture polish on the floor problem. I’ve misted over my floor a couple of times with it whilst cleaning and it is so slippy it’s lethal . Ooh, this sounds absolutely divine. I started de-cluttering recently, but I find myself getting super distracted and it never gets finished! Oops. Lose meat sandwiches are one of my favorites. And yes, sprucing up your home can really be exhausting. Try doing that at 8 months pregnant as well. Ugh! This looks fairly easy to make and very filling at the same time. 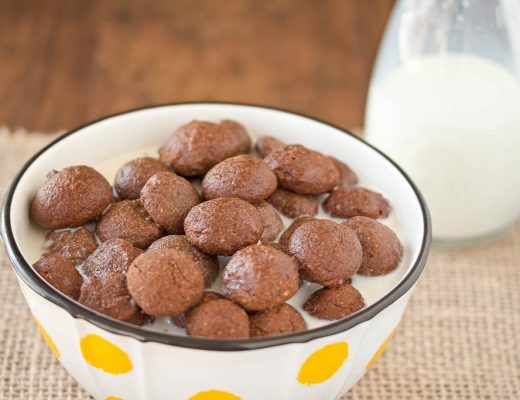 As a busy, Working Mom, I am always looking for easy meals like this one to make for my family. These looks delicious! I so want to eat one now. I am gonna make one later this week. I’m sure you will find your dream home soon! The loose meat sandwich looks mouthwatering! Everything that has mustard and some pickles is yummy! This looks great and so easy to change to veggie with some soya mince! I cant wait to try this one out. Looks like great comfort food. Oh no, naughty kitty. If that was at ours it would have been the kids that did it. Sounds like an interesting recipe. I’d never have though to put mince in a bun. I need to experiment more.